Get ready for another display of commercial dominance. 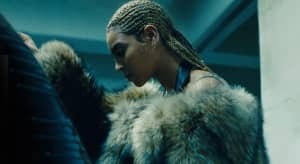 Initial sales projections for Beyoncé's LEMONADE suggested it would shift somewhere around 500,000 copies in its first week. Billboard corroborated that number yesterday, predicting roughly 450,000 in sales and another 100,000 album equivalent units from streaming. This number is likely to propel Beyoncé to a No. 1 debut on the Billboard albums chart. If she reaches that mark, Billboard reports she will become the first artist in history to have her first six albums debut at No. 1. She's currently in a tie with DMX, who also saw his first five albums debut at No. 1. The Kingston Trio had its first five albums climb to No. 1, but all the records did not arrive on the chart in the top spot. Timing is also helpful when it comes to No. 1 debuts: if LEMONADE arrived one week later, Beyoncé would be fighting for the top spot with Drake.